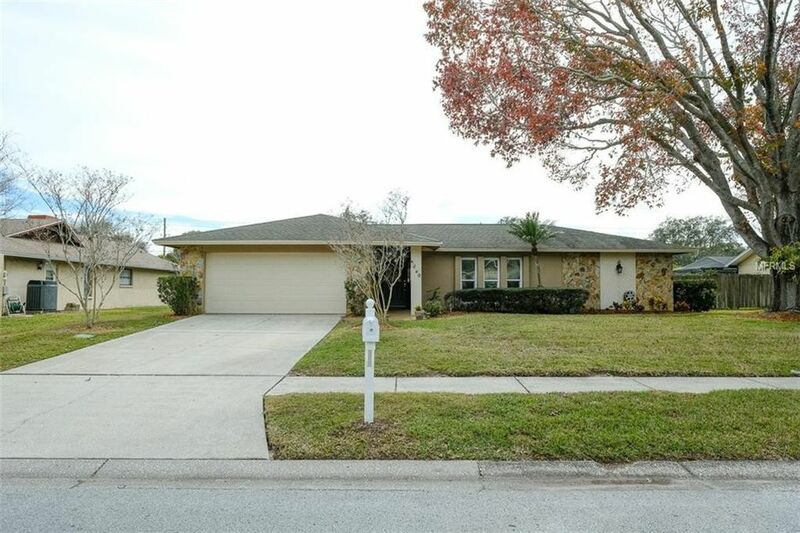 PRIDE OF OWNERSHIP ABOUNDS IN THIS BEAUTIFUL POOL HOME...ZONED FOR PALM HARBOR UNIVIERSITY HIGH SCHOOL! ENTER THRU THE LEADED GLASS ENTRY DOOR W/SIDE LITES TO PAMPERED PERFECTION...3 BEDRMS., 2 BATHS, OVERSIZED 2 CAR GARAGE! EXTENSIVE HIGH END PLANK LAMINATE FLOORING, NEWER FABULOUS KITCHEN W/RAISED PANEL MAPLE CABINETRY W/CROWN MOLDINGS, CORIAN COUNTERS, STAINLESS APPLIANCES, CUSTOM STONE & GLASS BACKSPLASH, BLT-IN WINE RACK, PENDANT LIGHTING, LG. SEPARATE BREAKFAST RM. W/CHAIR RAIL! LG. FAMILY RM. W/ZYRIAN STONE W/B FIREPLACE, BLT-IN BOOKSHELVES ON KNOTTY PINE WALL! VAULTED BEAMED CEILING IN FAMILY RM! SPLIT BEDRM PLAN...MASTER BEDRM. W/WALK-IN CLOSET, CUSTOM CLOSET SYSTEM, LG. SECONDARY BEDRMS! NEWER WINDOWS, NEWLY PAINTED 2018! NEWER HURRICANE RATED GARAGE DOOR! NEW ROOF 2012! NEWER HUNTER FANS! LG. LANAI AREA TO LG. POOL W/ELEVATED SPA...BOTH HEATED W/ENERGY EFFICIENT HEAT PUMP! NEWER PEBBLE TEC FINISH ON POOL & SPA! NEWER TILE ON POOL & SPA, NEWER SCREEN ON THE ENCLOSURE! WALL AND PRIVACY FENCED YARD! MINUTES TO QUAINT DOWNTOWN PALM HARBOR, PINELLAS TRAIL, GREAT A RATED SCHOOLS, AND BEAUTIFUL GULF BEACHES AT HONEYMOON ISLAND !! A MUST SEE!!! Directions: ALDERMAN RD. TO NORTH ON ENISGROVE DRIVE TO LEFT ON RIDGEGROVE DR. S. HOME IS ON THE LEFT.